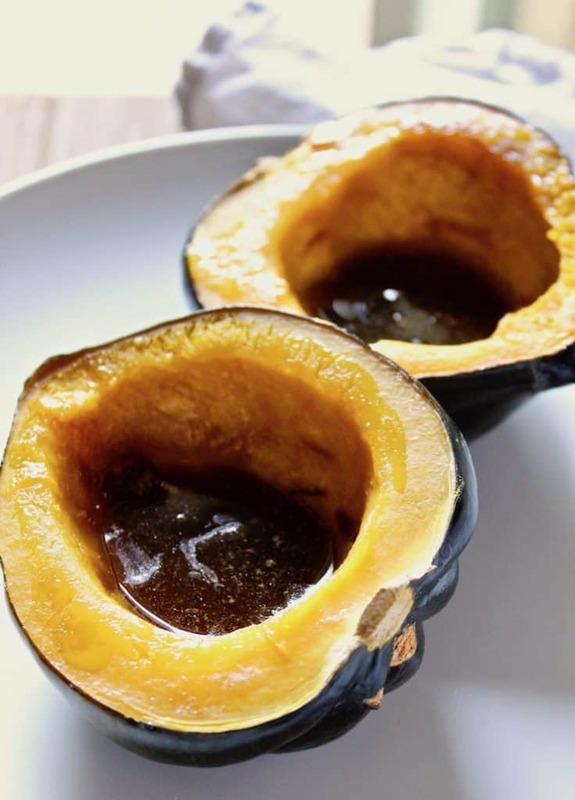 Easy baked acorn squash, with butter and brown sugar, perfect for fall and the holidays. One of my favorite things about the changing seasons is the changing seasonal vegetables, like winter squash. 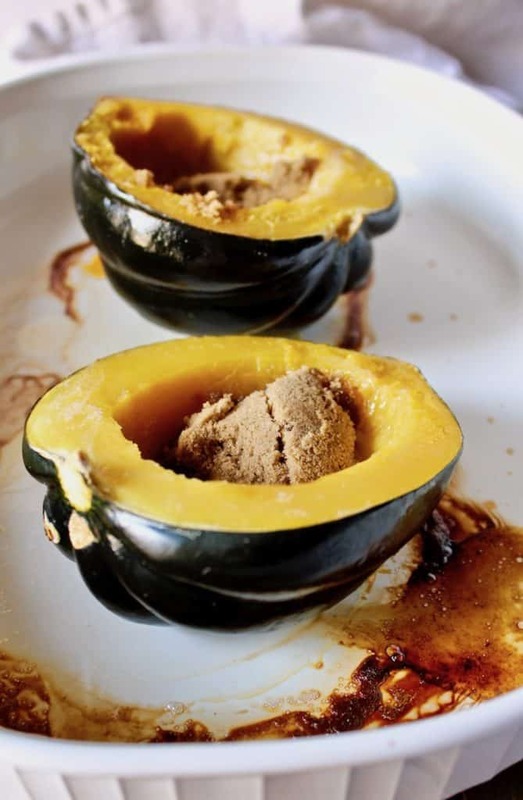 Acorn squash, and other varieties, are so good baked in the oven with a little butter and brown sugar. So simple and so delicious. I think the hardest part of this recipe is cutting the squash in half! Use a very sharp knife and be careful, take your time. Fingers out of the way and squash firmly stabilized on the board, slice through and rotate around until it’s cut in half. If the knife gets stuck, sometimes I bang the squash on the board to push the knife all the way through. The bigger the squash, the harder it is to cut. Hard part over, now scoop out the seeds and stringy stuff and discard (or save the seeds for roasting). Place the halves cut-side down in a baking dish. Pierce the skin a couple of times with the tip of the knife. Pour a little water in the dish and bake. After awhile when they’re tender and almost done, turn them over and add butter and brown sugar and then back to the oven to finish. 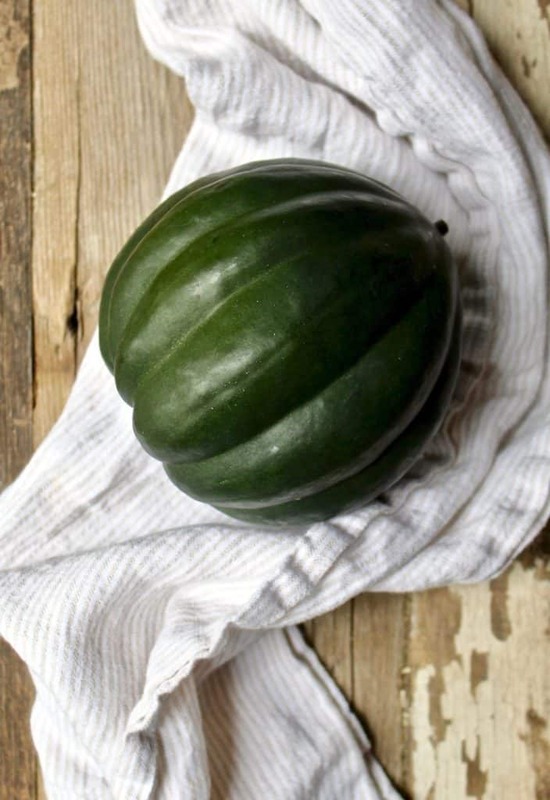 You can certainly bake other winter squash the same way. One of my other favorites is delicata squash, with it’s sweet potato-like dense texture. Butternut is good, too, although usually too big for this purpose. I like the size, texture and taste of acorn and delicata for baking. Since we’re talking seasonal and easy vegetable side dishes, you have to try my Brussels sprouts!! They are the best, I promise! 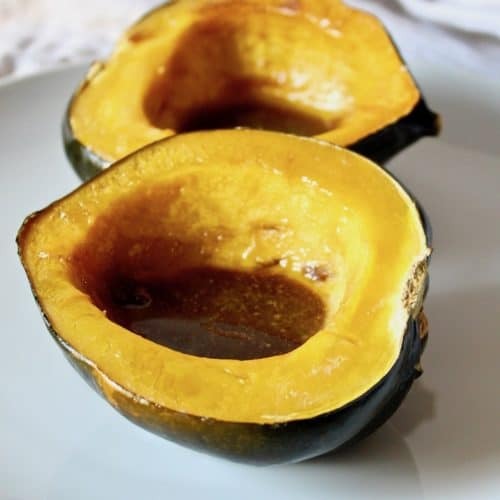 If you’ve tried this Baked Acorn Squash or any other recipe on the blog, then please rate the recipe and let me know how yours turned out in the comments below ~ I love hearing from you! You can also FIND ME on FACEBOOK, TWITTER, INSTAGRAM and PINTEREST. Never miss a post ~ sign up for The Hungry Bluebird Newsletter for a weekly email of new content. Cut squash in half carefully, from end to end, with a sharp knife. Scoop out seeds and stringy stuff with a spoon. Place cut-side down in baking dish and prick the skin a few times with the knife tip. 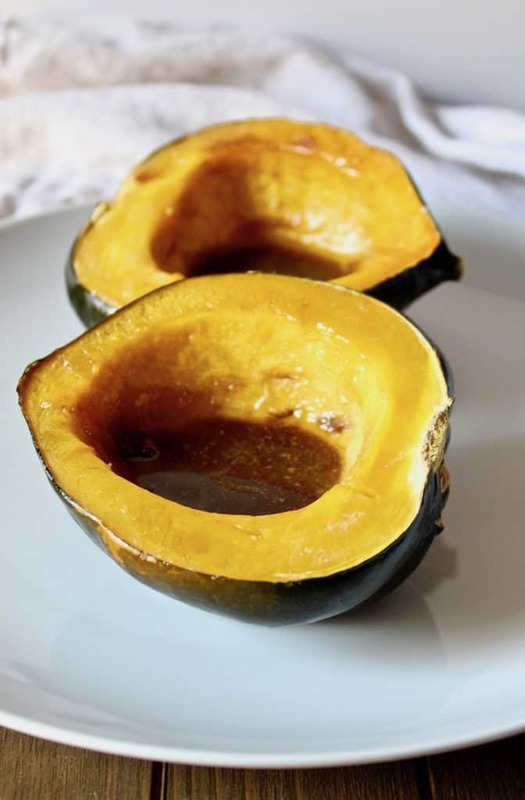 Add about a ¼-inch of water to the dish so the squash doesn't burn or dry out. Bake in oven for 40 - 45 minutes. 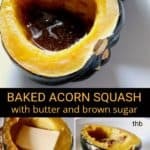 Turn squash over and add 1 tablespoon butter to each cavity, a sprinkle of salt, and then 1 heaping tablespoon of brown sugar. Return to oven and bake another 10- 15 minutes, adding more water if necessary. 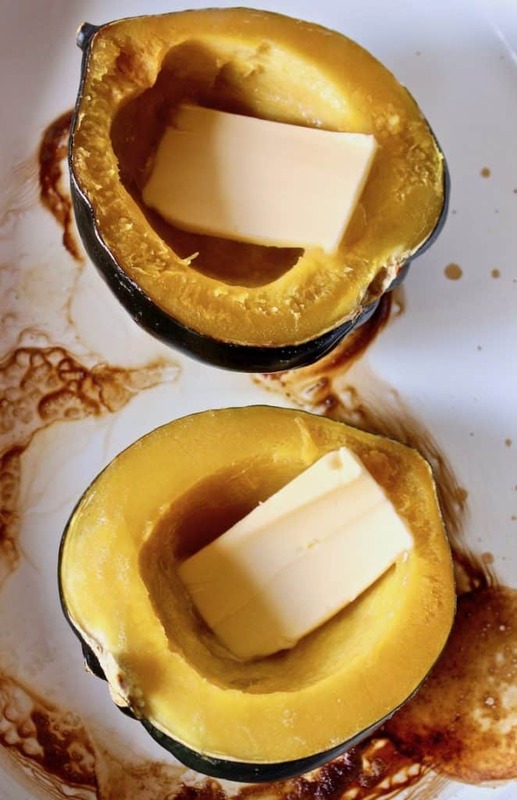 The squash will be very soft and tender when done, remove from oven and swirl the butter mixture around the sides and tops of the squash. Scoop out flesh and serve, make sure to get all the buttery sugar glaze! Enjoy! 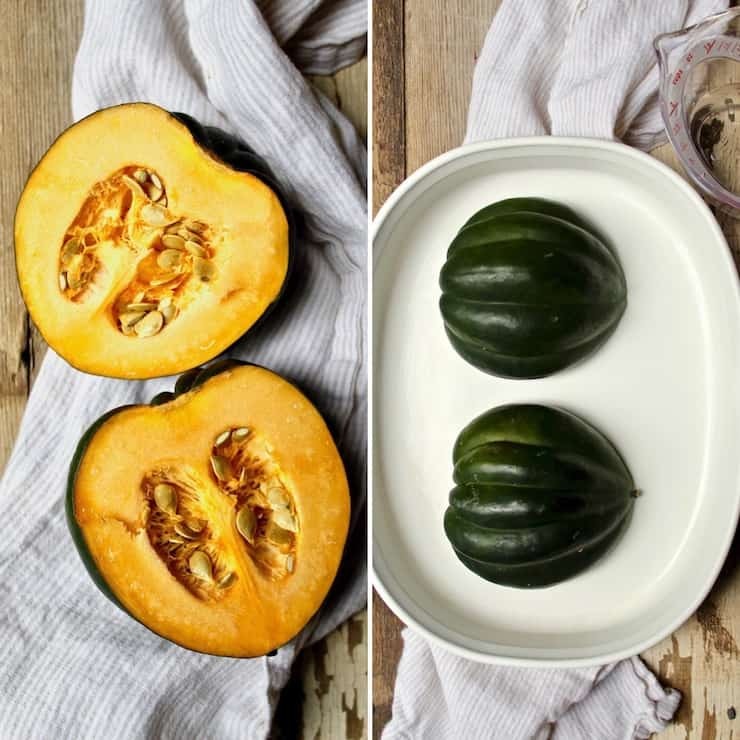 One acorn squash will yield 2 to 4 servings depending on the size of the squash and how big of a serving you like. Poetic. As in Edgar Allan Poe.